Located amid deep green forested mountainsides, containing some of the finest 1800s architecture in all of California and inhabited by a fun-loving, arts and outdoor oriented population , Nevada City is a perfect filming location. The downtown area is filled with colorful wood and brick buildings and the surrounding residential neighborhoods have some of the Sierra foothills’ finest examples of Victorian architecture. The surrounding countryside has rivers, lakes, forests, mountains, farms, ranches, vineyards and wineries and many other areas often sought by filmmakers, including some very small outlying villages. It may not rival New England, but the area boasts the finest fall colors in California. Several movies and commercials have been filmed in the Nevada City-Grass Valley area. 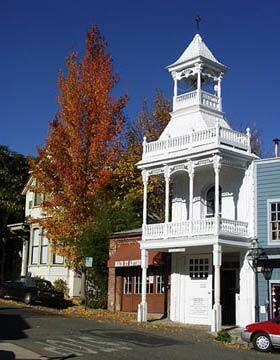 The Nevada City Chamber of Commerce welcomes inquires from filmmakers.